1 What is a Good Control? 3 What do Studies of “Neural Correlates” Tell Us? 4 How Large are the Magnitudes of Gains in Untrained Conditions? 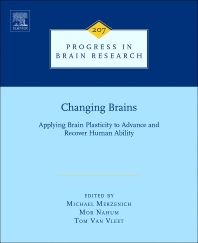 This volume of Progress in Brain Research focuses on the applying brain plasticity to advance and recover human ability. The volume starts off discussing brain plasticity in the young, adults and old brains with follow on discussions regarding the type of neuroscience-based training that is on offer in impaired child populations as well as discussing the therapeutics involved in adults.